5.27 points at 22 votes (rank 747). 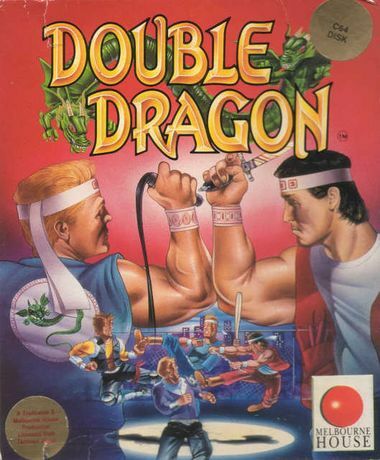 The Double Dragon game series belongs to the most well-known and oldest Beat'em Up games. The first part was at first developed for the arcade machine by Technos Japan Corporation in 1987. In general it is about beating yourself alone or in pairs through the levels in the role of the twins Billy and Jimmy Lee and at the end rescue a girl named Marian who had been kidnapped by a Street Gang, the Black Warriors. A speciality of the game is, that in the two-player mode you have to fight against each other in the end about who gets the girl. You fight with fists, legs and with any possible item that is lying around or that you nick from your opponents. With the items you can either hit the enemy (baseball bat, whip) or throw the items at them (knife, barrel, box, rock). Joy right + fire = footkick forward. Joystick to permanent fire and you will play through the game without problems. More than the punch is not needed in this game. H.T.W: "A bad conversion of the arcade game. 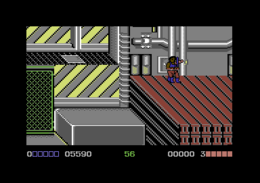 Apart from the fact, that the graphics and the movements of the sprites have nothing in common with the original, also all features of the machine were left out. Enemies, weapons, special moves are missing, the end fight in the two player mode is omitted. The sound is below every critic. There is no highscore list, not even an end evaluation. There are better ones for the C64...". TheRyk: "The music is the only thing I really like. Fighting is damn tough due to the poorly coded controls and the limitation of possible moves. 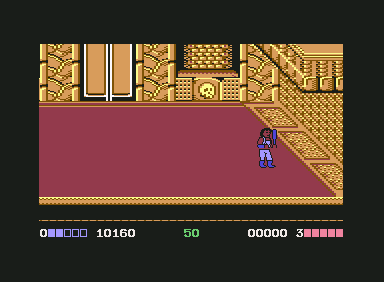 Additionally, the scrolling is halted until you finish an enemy. Due to that, you sometimes have to fight two opponents simultaneously with very limited manoeverability which means you have very little chance of survival, e.g. on the roof in level 2. This is really no good beat'em up game, actually even Target Renegade is more playble. I cannot rate the Mastertronic trash game Double Dragon higher than so-so 4 points, appreciating there is at least a 2 player mode, though it's not significantly better than the solo game." 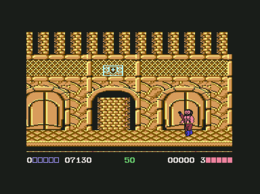 In 1991 the game was re-issued (see Double Dragon (Ocean)). This page was last modified on 25 July 2015, at 22:41.